August Landmesser, the man who folded his arms. The photo was taken at the launch of a German army vessel in 1936, during a ceremony that was attended by Adolf Hitler himself. Within the picture a lone man stood with arms crossed as hundreds of men and women around him held up their arms in salute and allegiance to the Nazi Party and its leader, Adolph Hitler. Everyone in attendance is showing their undying support for Der Führer by throwing out their very best “Sieg Heil”. August Landmesser, grimacing with arms crossed, stood strong and defiant as he showed his disapproval by not displaying support for the Nazi Party. 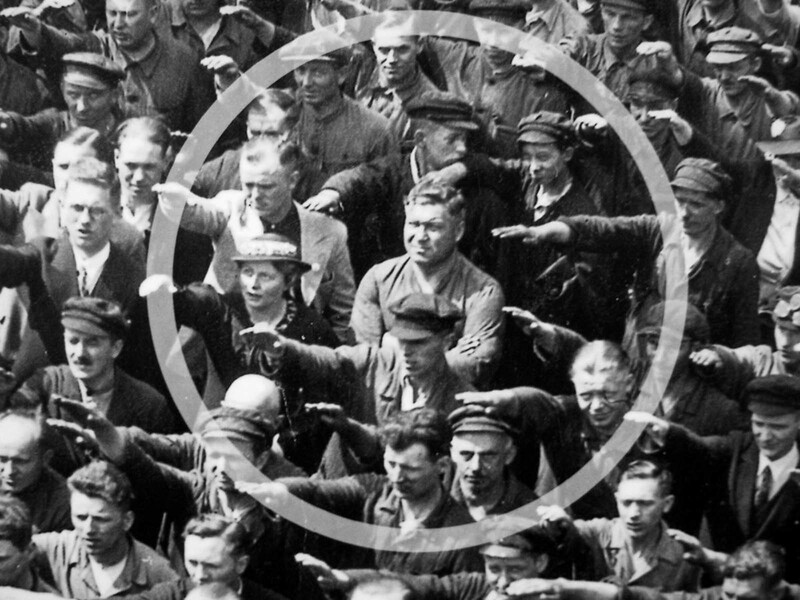 What made this photo and Landmesser’s defiance unique is that it represented the protest of one man, in its most sincere and pure form. The source of Landmesser’s protest, like many great tragedies, starts with a love story. 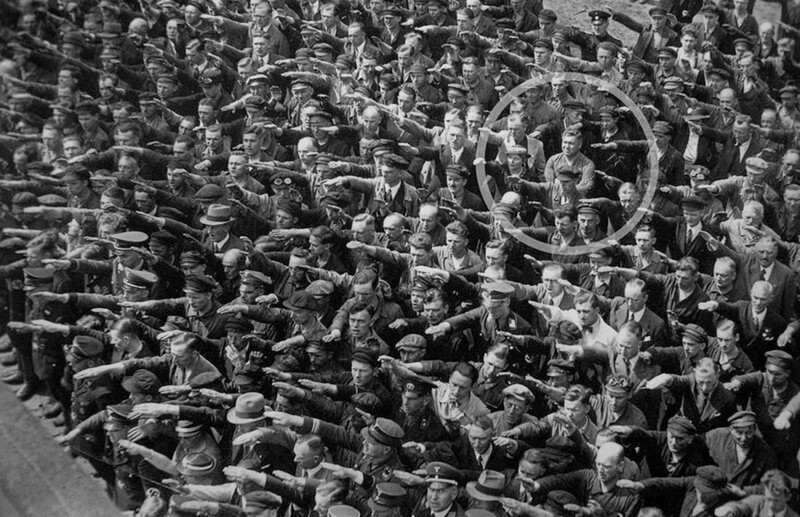 The story of August Landmesser’s anti-gesture begins, ironically enough, with the Nazi Party. Believing that having the right connections would help land him a job in the pulseless economy, Landmesser joined the Nazi Party in 1931. Little did he know that his heart would soon ruin any progress that his superficial political affiliation might have made. In 1934, Landmesser met Irma Eckler, a Jewish woman, and the two fell deeply in love. Their engagement a year later got him expelled from the party, and their marriage application was denied under the newly enacted racial Nuremberg Laws. August and Irma had a baby girl, Ingrid, in October of the same year, and two years later in 1937, the family made a failed attempt to flee to Denmark, where they were apprehended at the border. August was arrested and charged for “dishonoring the race” under Nazi racial law. He argued that neither he nor Eckler knew that she was fully Jewish, and was acquitted on 27 May 1938 for lack of evidence, with the warning that a repeat offense would result in a multi-year prison sentence. The source of Landmesser’s protest, like many great tragedies, starts with a love story. The couple publicly continued their relationship and a month later August Landmesser would be arrested again and sentenced to hard labor for two years in a concentration camp. He would never see his beloved wife again. Eckler was detained by the Gestapo and held at the prison Fuhlsbüttel, where she gave birth to a second daughter Irene. Their children were initially taken to the city orphanage. Ingrid was later allowed to live with her maternal grandmother; Irene went to the home of foster parents in 1941. Later, after her grandmother’s death in 1953, Ingrid was also placed with foster parents. A few letters came from Irma Eckler until January 1942. It is believed that she was taken to the so-called Bernburg Euthanasia Centre in February 1942, where she was among the 14,000 killed. In the course of post-war documentation, in 1949 she was pronounced legally dead. August would be released in 1941 and began work as a foreman. Two years later, as the German army became increasingly mired by its desperate circumstances, Landmesser would be drafted into a penal infantry along with thousands of other men. 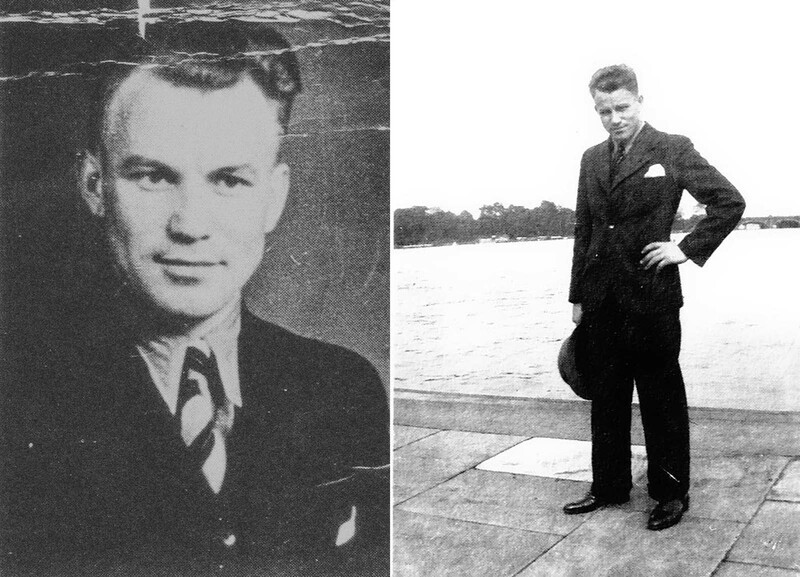 He would go missing in Croatia where it is presumed he died, six months before Germany would officially surrender. His body was never recovered. Like Eckler, he was declared legally dead in 1949. Believing that having the right connections would help land him a job in the pulseless economy, Landmesser joined the Nazi Party in 1931. In 1951, the Senate of Hamburg recognized the marriage of August Landmesser and Irma Eckler. Their daughters split their parent’s names, Ingrid taking their father’s and Irene keeping their mother’s. In 1996, Irene Eckler published the book The Guardianship Documents 1935–1958: Persecution of a Family for “Dishonoring the Race”. This book about the story of her family includes a large amount of original documents from the time in question, including letters from her mother and documents from state institutions. The photograph of August Landmesser refusing to do Sieg Heil was published for the first time on 22 March 1991 in Die Zeit. The photograph version with the circle is the original copy. The ship “Horst Wessel” that everyone is saluting was claimed by America as a war prize after WWII. It was recommissioned as a Coast Guard Cutter, renamed “Eagle” and it’s still in service. the pic should be titled, the smartest one. look at the people behind, they're probably going, "oh shlt !!! dude F'd up!". you can also see other looking from farther away. Wessel spelled with one "l" and Sieg, not Seig. and a grammer nazi as well. no-one carees...it all about the guy...he is the coolest. Not to say what he did wasn't bold but would he have done the same thing if he wasn't married to a Jewish woman? It's sad that empathy only comes when you have a dog in the race. But, I'm proud that he did this. Observer, your hypothetical question is pointless. What's sad? It's sad that you would even make such a demeaning statement. Perhaps the real question is where have YOU stood your ground when all around YOU were - so to speak - raising their arms in salute to a lie? Don't waste your time (or mine) with drivel about a dog in a race. When I see a picture of you demonstrating the same degree of courage that this man had I'll give your comments the same respect that I now give to him. We need more men, and women, that have the guts to stand against the lies in our own country. One of the dark secrets and stains about Denmark's role after the outbreak of WW II, and a counterpoint to her citizens later saving Jews in 1943, is that from 1940-1943 the country's puppet government apprehended and deported stateless European Jews, some of whom were even married to Danes and many of whom met their death at the hands of the Nazi regime. Those interested should consult the published research of historian Vilhjálmur Örn Vilhjálmsson. Interesting,funny the Danes themselves don't seem to mention that. Maybe the baby Irma is holding in the photo is not Irene, but the baby of whomever took the photo? That is my guess. It looks like Irma may have a slight baby bump in the photo and is pregnant with their second daughter. 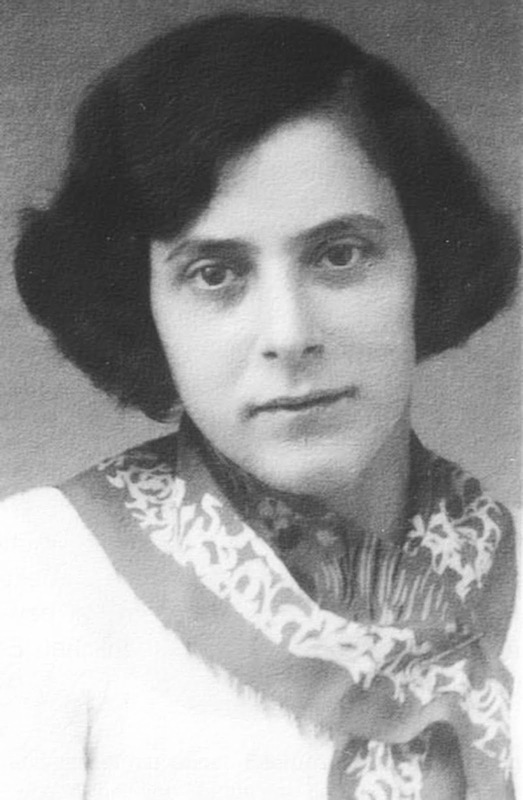 "Eckler knew that she was fully Jewish, and was acquitted on 27 May 1938 for lack of evidence, with the warning that a repeat offense would result in a multi-year prison sentence. The couple publicly continued their relationship and a month later August Landmesser would be arrested again and sentenced to hard labor for two years in a concentration camp." I looked at the picture and it seems as Ingrid is approx. 3 years and Irene 1 year and the photo is taken in June which makes sense. A month later means that August was arrested approx. on the 27 of May 1938. I appreciate this article and add some more facts since some people questioning if it can be a photo of the family. All dates seems to be correct and those who know the Germans are also aware of their perfectionism in documentation of everything. "The couple nevertheless lived as a family and produced two daughters, Ingrid (in October 1935) and Irene (in August 1937). In September 1937 the father was taken into custody, but released in the following month with a warning to end the relation-ship. He resumed it all the same, and in July 1938 the couple were arrested." good point...maybee ,like all prisoners you can get a visitor....maybee..some detail is missing...but the original photo is what matters. I agree--I have the same question about the family picture. A second question is whether the man with crossed arms is the same man in the other pictures. The man in the shipyard picture seems heavier and doesn't have the same hairline. THANK YOU!!! I was trying to figure out the whole family photo thing too! Whole thing seems a bit fake, like why is the area around where he's standing the only place without people packed in super tightly? The people in the front are packed in tight, but not in the back of the pack on the right side. It's a ship launching ceremony and there wouldn't be a lot of space in the dock area. So workers and military present would be kind of pushed together. There is actually several people who did not raise their hands. The picturre of the family looks "photo shopped." Otherwise he was a giant of a man and she very small in stature. Its called "forced perspective". It's an optical illusion created when objects are separated by distance (while both in focus) which causes them to appear next/close to each other, but the further of the objects will seem smaller than it actually is. It's like when you see photos of people holding the Eiffel Tower in the hand, or Leaning Tower of Pisa. 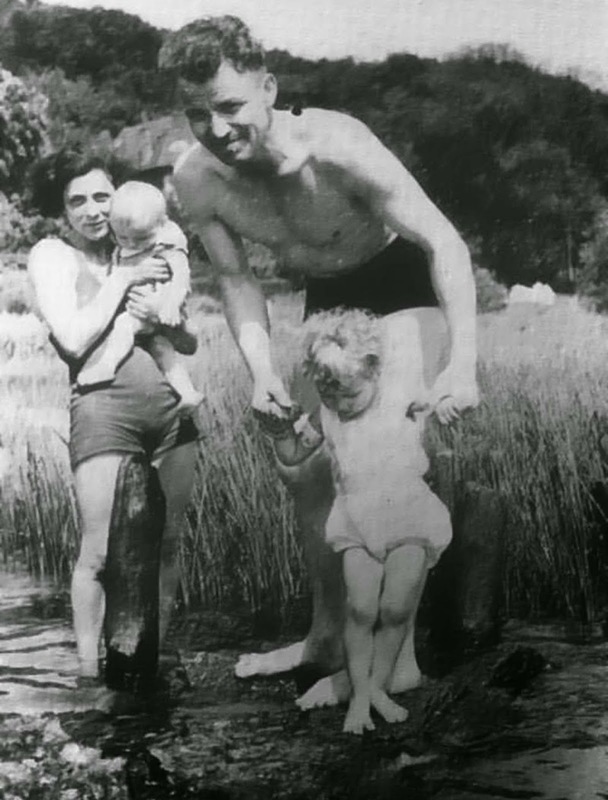 In this photo you can clearly see that he is standing on a log holding his daughter. His wife is a few meters behind him in ankle deep water. "A rival and far more convincing candidate has emerged in recent years, Wegert Gustav, who did work at the shipyard and who objected to Nazism on grounds of his Christian faith and who died in 1959, when Germany’s totalitarian nightmare was over." Source: German non-saluter myth. Just looks like having your own opinion and publish it in the internet community today. Or publish problematic infos about one governement in north america and his affiliates, also today. History IS repeating. What I am about to tell you is something you've probably never heard or read in history books. I am a witness to history. I cannot tell you that Hitler took Austria by tanks and guns; it would distort history. We voted him in. If you remember the plot of the Sound of Music, the Von Trapp family escaped over the Alps rather than submit to the Nazis. I wasn't so lucky. My family chose to stay in our native Austria. I was only 10 years old, but bright and aware. And I was watching. We elected him by a landslide – 98 percent of the vote. I wasn't old enough to vote in 1938 just nearly 11 years old. But I do vividly remember. Everyone thinks that Hitler just rolled in with his tanks and took Austria by force. Not so. Hitler was welcomed to Austria. In 1938, Austria was in deep Depression. Nearly one-third of our workforce was unemployed. We had 25 percent inflation and 25 percent bank loan interest rates. Farmers and business people were declaring bankruptcy daily. Young people were going from house to house begging for food. Not that they didn't want to work; there simply weren't any jobs. My mother was a Christian woman and believed in helping people in need. Every day we cooked a big kettle of soup and baked bread to feed those poor, hungry people – about 30 daily. We looked to our neighbor on the north, Germany, where Hitler had been in power since 1933. We had been told that they didn't have unemployment or crime, and they had a high standard of living. SEARCH online for the REST of this story. Many skeptics attempt to bash this writing as a propaganda piece making comparisons to today's political administration- it is *not*. It is descriptive, useful and apt. It is truthful and factual. I would really like to hear more of your experience in this time era and if you have, any photos. I'm from Australia and born well after the war. National Socialism seems to be greatly misinterpreted and not at all understood. It actually is probably exactly what people want and need, the Democratic states of today have plunged the people into such a predicament, I always ask my countrymen, "How far does it have to go?". The author of this article has a unique name and can be found, you need only look. I would just like to add, it does not appear anyone in the photo cares. If only our nations people were so unified and dedicated to the leadership and one another. but no zither music accompanyed that.when the germans came they threw flowers.....it was named....bloomen kreig. many people have said Austria was far more anti-semitic than Germany....maybee because it was an old empire not a young state....or maybee because hitler was born there it got the blame....but an australian spy who was there claimed they had jews scrubbing footpaths and some others were tied to a big wheel and they beat them as it turned.....nice....i met her in port maquarie and she stood by the statments.....and had an interesting life....Nancy Wake....that was her name.....hard a coffen nail....and quite a looker in the day. This man is not the only one in the crowd not saluting... There are three other men equally distant around him. I have to point out, in the pic of *One* man not saluting. But if you look closer, there's two more men in darker outfits directly behind him that do not appear to be saluting either. You mean like Wossisname Kaepernick refusing to stand for the National Anthem? I'm down with that, but it sure sends Trumpists and alt-Rightists into a rage. A nation has not only a right, but an obligation, to protect the ethnic and racial composition of its people. Surprised nobody mentioned that Horst Wessel, the man the ship was named for, was a brownshirt (member of the S.A.) street fighter who was killed in a battle with Communists. He was treated as a martyr, and the song, The Horst Wessel Lied, was the Party anthem. I'm a little surprised they used his name on such a small ship, but the S.A. was downgraded after the Night of the Long Knives, in 1934. For some reason the song was almost never heard in America. Youtube has a varying policy, sometimes posting several versions, other times either removing them or accompanying each clip with a notice that it's a Nazi propaganda song. That was one reason the director of Casablance had the German officers singing Wacht Am Rhein in the famous scene where the French join in singing the Marseillaise and drown them out. Nobody would have recognized the Horst Wessel Lied. DKM (Deutsche Kriegs Marine) Horst Wessel was a training ship, a 3 masted sailing ship. It's name was changed to USCGC (United States Coast Guard Cutter) Eagle after the war. USCGC Eagle is currently in commission and still training sailors. In a very round-about way, the memory of Horst Wessel is still alive. Just as a minor quibble, the Horst Wessel was a German navy ship, not an army ship. Incidentally the USCGC Eagle is about a mile from where I am right now.